In an increasingly chaotic world characterized by deep inequality and growing disillusionment with governments, public institutions and evidence, progressive movements offering a compelling and hopeful narrative for change have never been more important. Social justice, environmental sustainability and social solidarity are the keys to an inclusive, productive future for people in Canada and around the world. Yet progressives and progressive organizations in Canada are often working in silos, communicating in isolation or at cross purposes, resulting in a weak common front that fails to realize the full potential of progressive ideas. How can diverse progressive movements better develop a shared understanding of the challenges facing Canada today? How can we learn from each other and work together more effectively? How can we translate our knowledge and ideas into real social, political and economic change? These were some of the difficult questions posed to representatives from more than three dozen progressive organizations at Alternative Futures, a meeting organized by the CCPA, the Canadian Women’s Foundation and Greenpeace Canada on October 1st. 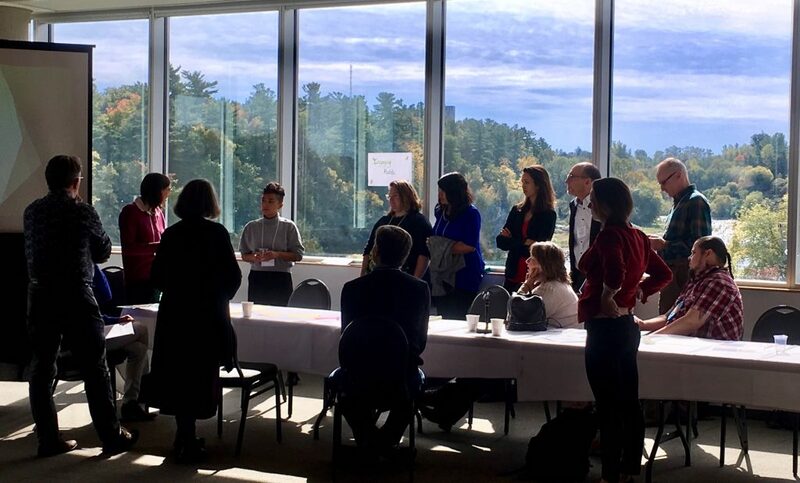 Activists, organizers and researchers from the labour, environmental, feminist, anti-racist and other social movements gathered at Carleton University to build common cause and connection in a novel cross-movement dialogue. From the outset, participants were positive and engaged. “I’m nourished by the bravery around this table,” remarked one social justice campaigner. Another labour activist said she was “here to be inspired.” The opportunity to connect and reconnect with colleagues at such an important moment energized the room. To that end, the opening keynote from EKOS pollster Frank Graves explored Canada’s “new public outlook” as revealed through nationwide opinion polling. The good news: Canada is a predominantly progressive place and is slowly becoming more progressive over time. The bad news: a growing reactionary movement – the rise of what Graves calls “ordered populism” – threatens the progressive consensus by galvanizing opposition at the extremes. Graves argues that a new political spectrum is emerging: not the traditional left-right axis but a new open-authoritarian axis. The “ordered populists” at the authoritarian end of the spectrum tend to oppose progressive values like immigration and gender equality, but they are not necessarily traditional conservatives. Many historically progressive voters – including young men and working class people – are turning to extremist options like Doug Ford. The take-away for progressive organizations was to place a greater emphasis on shared values when pushing their ideas. Data, policies and plans are important, but they’re not how you make a connection with people. We need to be listening to people too, even and perhaps especially to those communities whose support may have been taken for granted. In the panel that followed, representatives from five Canadian movements – advocating for the environment, students, women, refugees and economic equality – shared their experiences fighting for social change. Asked how they define success, the panelists offered a variety of measures, from legislative changes to shifting the political rhetoric to improved living conditions on the ground. When it came to the barriers facing their movements, panelists offered a wide range of specific issues, but generally agreed on two points. First, capitalism itself presents a fundamental constraint on progress by commodifying public goods, such as education, and ignoring the long-term public interest, such as climate change. Second, the historical and ongoing marginalization of certain groups is a significant obstacle to genuine justice. Intersectionality is a crucial concept for progressive movements to embrace moving forward. Finally, the panel identified opportunities for future progressive change. Despite all the challenges we face today, the panelists pointed to the many historical and ongoing successes of progressive movements as motivation to keep up the fight. In the first afternoon session, participants split into working groups to discuss challenges and engagement strategies for reaching four key audiences: federal policy makers, traditional media, social media and the general public. With respect to federal policy makers, the participants highlighted the issue of how to make the most of limited resources. Can we really make a difference by talking to ministers or should our efforts focus on educating young public servants? How valuable are official government consultations? Can we get more leverage by mobilizing opposition politicians? How do we compete with well-resourced industry lobbyists? No organization can do it all, suggested participants, but we still need to be engaging government at all levels, which means greater coordination between progressive allies to ensure we’re not unnecessarily duplicating our work. The traditional media landscape is in a period of upheaval as free, digital distribution erodes newsrooms across the country. The dearth of journalistic capacity is an opportunity to push progressive ideas, participants learned, by supplying outlets with content or otherwise building partnerships with media organizations. Social media poses serious risks to progressive organizations, from hacking to cyber violence to the proliferation of fake news, but there’s no doubt we should be engaging with audiences where they gather. Making the most of the opportunities social media presents, while protecting each other from online hate, requires flexibility and creativity, said participants, which may require more dedicated communications resources, training and personnel. The general public is perhaps the most unwieldy audience, but it’s also the most straightforward to address, suggested participants. A simple, united narrative is key to progressive change at all levels of Canadian society. With a compelling, values-based vision and message, we can engage with people directly, especially people we haven’t reached before, to build support for progressive change. Using a novel “fishbowl” format where participants rotate through a focused small group discussion at the centre of the room, the group grappled with how to achieve justice, equality and environmental action in the coming years. One of the greatest challenges facing progressives is how to work together on areas of disagreement, such as pipeline politics, which risk pitting environmental activists against workers. We must also reconcile fundamentally different theories of change: for example, incremental versus systemic change and short-term versus long-term change. There’s no easy solution to these divisions, acknowledged participants, but they agreed that ongoing dialogue is crucial. The group also strategized around messaging. Having the “right” ideas isn’t enough if those ideas don’t resonate with people’s lives, suggested participants. We need to work harder to understand what underpins the resistance from some audiences. For example, populist fear-mongering may be misguided or problematic, but progressives can’t simply dismiss people’s anxieties about change. Empathy is essential, even for those who oppose our values. And this requires authentic engagement and, perhaps most importantly, listening. Moving forward, participants agreed that communicating the interdependence and connections between progressive policy ideas is essential for allied movements, and tools to help track and connect with each other’s asks are critical. The CCPA’s Alternative Federal Budget, which brings together nearly a hundred public policy experts and civil society organizations across a range of sectors to propose a comprehensive plan for the Canadian economy, is one such tool with a history of creating change at the federal policy level. The day’s recurring themes included the challenge of right-wing populism and the practical obstacles to effective coordination among progressives. Yet hope for the future prevailed. Funding for progressive organizations may be scarce, but opportunities for attracting new supporters abound – a significant human resource-based strength. Policymakers may be resistant to change, but our ideas are gaining traction at all levels of government. Regressive movements may be on the rise, but Canada still demonstrates an appetite for justice, sustainability and solidarity. As progressives and progressive organizations prepare for a pivotal political fight in 2019, we should push forward in the knowledge that by working more concertedly together, a positive, realistic narrative that resonates with people’s experiences and hopes can gain traction and, ultimately, win the day. • Understanding Québec’s Orange Wave Part Three: What Does the Orange Wave Mean? • We have a new federal government. What now? ooops, you excluded the disabled in your call for collaboration.